For year-round seasonal interest, Pieris japonica should be on every northwest gardener's must-have list. Also called Lily-of-the-Valley bush or Japanese Andromeda, Pieris is a broadleaf evergreen shrub that typically grows 9-12’ tall with a dense, upright habit. Bead-like flower buds appear in late summer for the following year, dazzling all winter long in contrast to the dark green foliage. The buds finally open in late winter or early spring, smothering the structural shrub in fragrant, cascading chains of dainty, urn-shaped flowers in white, pink or red. 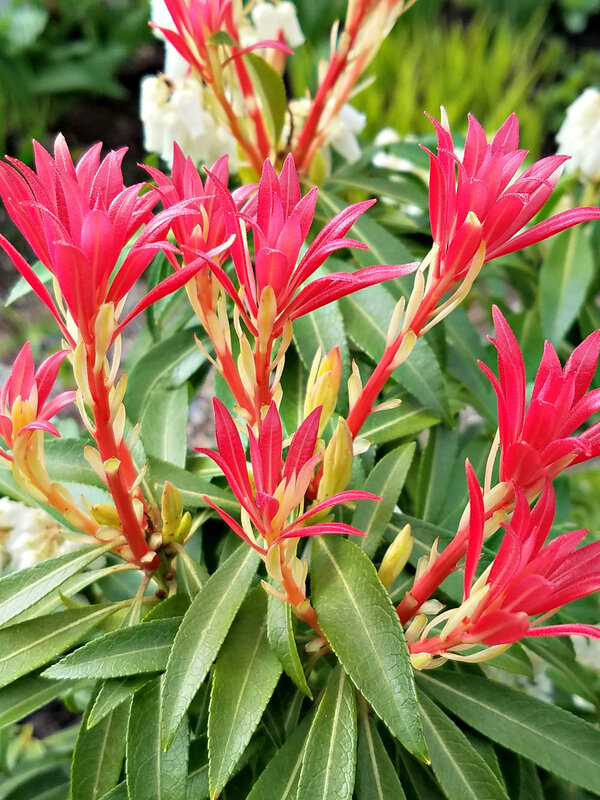 The showy flower clusters are followed by colorful new foliage growth, which varies by variety, from warm bronze to brilliant pink to fiery scarlet. Pieris are related to rhododendrons and azaleas and, along with camellias, make good planting partners as they share the same preference for well-draining, acidic soil. Pieris shrubs grow and flower best when planted in full sun or partial sun and shade, but they should not receive hot afternoon sun. They will grow in full shade, but generally do not flower as well and the new foliage growth is usually not as brilliant. Prune them as the flowers die away so they will have time to produce blooms for the following year. Snip a few before the blooms are spent—they work well as cut flowers, too! Trim back overgrown or diseased branches at their base as needed during the growing season; otherwise, pieris requires little pruning. Some of the larger varieties can be shaped into small trees, and are known for groovy striped peeling bark. Among the more than 40 varieties of Japanese pieris, I have a few favorites. P. 'Forest Flame' is a hybrid growing to 10 ft. tall and 3-5 ft. wide, and features more abundant flower clusters than the parent P. Japonica. Flowers are white, and new foliage growth appears to be on fire, hence the name. 'Mt Fire' and ‘ Valley Fire' also are notable for their brilliant scarlet new growth. Some have been developed for smaller form, like 'Bisbee Dwarf' growing only to 2 ft. tall, 'Little Heath' growing 2-4 ft. tall with interesting, gray-green leaves edged in white, or 'Karenoma' growing 3-6 ft. tall. These and other dwarf varieties make great evergreen additions to your container gardens. Some varieties are famous for their showy flowers, such as 'Brouwer's Beauty' with dark red buds opening to white. 'Dorothy Wyckoff' also shines with deep red buds, opening to pink then maturing to white. She also has bronze new growth and a compact growth habit. For pure white blooms in a large floral spray, try 'White Cascade'. There is something interesting and beautiful about Pieris at any season. Beautiful bead-like buds sparkle in the winter ice and snow, and impressive flower clusters emerge in spring, absolutely smothering the shrub or small tree. Dazzling, colorful new leaf growth unfurls in spring and summer, and there is a variety of foliage colors and patterns to enjoy year round. Add unique bark to the list of must-have traits, and you have a real show stopper in your Pacific Northwest garden.